In the last two posts, I’ve been discussing the Yoshikoder sentiment analysis project in my Communication Research class here at Shepherd University. My first post looked at the project in general. And the second, most recent post, looked at how to teach computer-assisted content analysis using the Yoshikoder computer-assisted content analysis software and the activities I provide my students to prepare them for the project. I encourage you to check out those posts for background and set up! Ok, now on to sharing the assignment itself and providing a brief overview of it. 1) give students a hands-on look under the hood of sentiment analysis – that is, to understand HOW it works and its flaws. So here’s the set up to the assignment (which you can see below). This hands-on learning project is based on a real brand and a realistic but made up scenario. I do this with both this assignment, and my first project in this class. Specifically, I provide The Situation or Problem / Campaign goals and objectives (of an imaginary campaign that is ongoing or happened) / benchmarks / KPIs. In this case, the situation had to do with a popular online retail brand and rising customer complains and dissatisfaction as the brand has grown beyond its core base of loyal customers in recent years.I’ve redacted the brand and the situation from the below assignment. But you can fill in your own. I rely on Stacks (2011) model for writing the problem, goals, objectives. While I provide the research objective(s) in my first project, in this project students must come up with the research objective(s) and RQ(s). I then provide some benchmarks. In this scenario, at a certain point in time sentiment was strong (let’s say, 70% positive). And then after the hypothetical situation, it dropped (say, to 50%). The students have been recently introduced to the concepts of benchmarks and KPIs via a brief lecture, so this is their first experience with these concepts. They are given 1 KPI (let’s say 65% positive sentiment) against which to measure their success. Keep in mind that the situation assumes that a campaign already took place aimed at addressing decreased customer satisfaction and negative comments on Twitter addressed at the brand of choice. We are now seeking to assess whether this campaign that happened successfully increased sentiment towards the brand (at a deeper level, repaired relationships and the image of the brand among the online community). 1) Since we’ve discussed sentiment and its flaws, they need to think about the valence of sentiment (The AFINN dictionary scores terms from -5 to +5), and they need to research and understand how AFINN was designed and works (I provide some sources to get them started). If you’re not familiar with the AFINN dictionary, it was designed for sentiment analysis of microblogs.It is a free sentiment dictionary of terms you can download and use in Yoshikoder. For more details on the assignment, check out the assignment embedded below and the requirements for what must be turned in. My previous post covers some activities we do to build up to this assignment. So that’s all for now! Please feel to use this assignment, to modify it, and improve it. If you do, come back and share how you have or how you would improve upon it and modify it in the comments below! If you want to know more about my Communication Research class, please see this post which includes the syllabus. This is the third and final post on what’s been a popular series of posts – becoming a Google Scholar power user. Post #1 explored the advanced search features of Google Scholar, and post #2 explored why you should have a Google Scholar profile. This post about the Recommendations feature comes last because you must have a Google Scholar profile in order to use it. In past blog posts, I’ve written about great ways to find research articles for your literature review. Specifically, I’ve talked about using Google Scholar search, and the Mendeley search option. Google Scholar recommended research is another way of finding research articles that I’m loving. It is super easy to use and I’ve found tons of articles I wouldn’t have found before. As you recall, these recommendations are based on your citations – in other words, what you’ve published online. So of course they are going to be tailored to your research interests. If you have your Google Scholar profile set up, Google Scholar will recommend new research articles to you based on your publications. So the recommendations are almost always super relevant and helpful for future studies! To access these, go to scholar.google.com and click “My Updates” at the top. Tailored scholarly article recommendations – what could be better? Hope you enjoyed this series of posts on Google Scholar! If you did, please share this post! post #2 explored why you should have a Google Scholar profile. A Google Scholar profile has many benefits. It is a public profile that provides author photo, institutional affiliation and contact information, and importantly an interactive list of all articles a particular scholar has published. (Get started with Google Scholar profiles). Google Scholar automatically populates your list of research articles by associating your name with articles it has indexed. You can also add co-authors, and keywords for your research agenda. 1) Help people find your work. Remember that author feature I discussed int he previous post? Google Scholar search results allow searchers to click an author’s name to see what else they’ve published. This links directly to your Google Scholar profile with the list of all your research articles. If you have a website/blog, you can add a link so people can connect with you. 2) Track Citations of Your Work. What’s really great, is your Google Scholar profile summarizes some really informative stats. This includes the number of citations for each article you’ve published, and up to date summary statistics across time. For example, here is my Google Scholar profile. These numbers are helpful to have! For example, when doing my mid-tenure review, I provided a brief context / explanation of each publication I had (this was a recommendation made to me by a faculty member). The purpose was to provide an explanation of the significance of the work, and how it related to my research agenda. I noted the # of citations particular publications had received according to Google Scholar. 3) Follow New Citations. You can easily follow new citations of your work, and get Google Alerts emails when articles are published that mention your published works. This is great to know who is citing you, the impact your work is having, as well as finding articles related to your research interest that you may want to read. 4) Follow New Article. Have something in press and want to know when it is published? Go to your profile and click “Follow new articles.” You’ll get an email alert when the time comes! 5) Library. As discussed in the previous post on Google Scholar, you need a profile to use this feature. See explanation in last post. 6) Recommendations – Having a Google Scholar profile enables you to get recommendations. I’ll discuss those in our next post. 7) Easily Find The Work of Your Favorite Scholars You can see the work of scholars whose research you enjoy by searching an authors name in Google Scholar search, or directly from your profile page (assuming they have a Google Scholar profile). 8) Follow Fav Scholars. Want to get alerts every time a particular scholar publishes something new? Go to their scholar profile and click “follow new articles.” You’ll get an email alert every time they publish something. You can also follow new citations of their work, to receive emails every time someone cites their work. That’s all for now! Update: Post #3 is now available: why you should have a Google Scholar profile. What other benefits of Google Scholar profiles are there? How do you use Google Scholar profiles? See all my academic Tips, Tricks, and Productivity Posts. 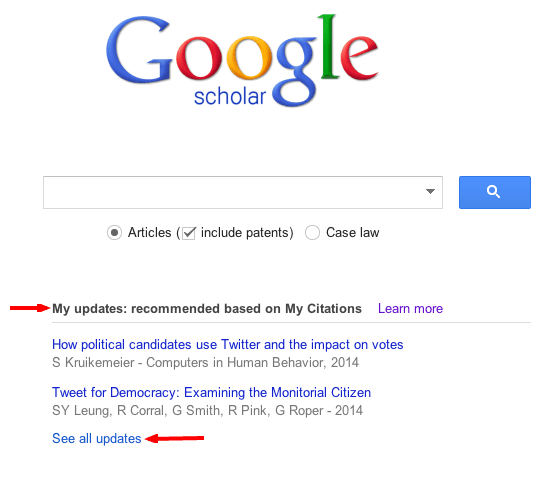 Update: Posts #2 (Google Scholar Profiles) and #3 (Google Scholar Recommendations) are now available. I love Google Scholar. It is useful for not only your research agenda, but also it is a tool to teach your students about. When teaching students about finding academic research, no discussion is complete without Google Scholar. In fact, I tell my students this is my go to source… though I’m sure the library probably wouldn’t be happy to hear that. GScholars primary purpose is as a search engine for scholarly articles. Simply goto: scholar.google.com and search for an article title, subject (e.g., a theory, construct), keyword, or author. There’s much more to GScholar than a simple search. GScholar has some little known (and some very new!) features that are very useful. Here’s how to become a Google Scholar Power User, Part 1 – Advanced Search Features: (See: Post #2 in this series on Google Scholar Profiles). It works just like Google, but it indexes academic publications. Many libraries are linked with Google Scholar, such that if you search Google Scholar and an article comes up that your school library has, you can access it directly through your search engine results. (While this often happens automatically when on campus, you can find out if your library has the article when away from campus as well. Go to your settings, click library, and do a search for your universities library. Then click save). Another great benefit is that sometimes articles are hosted online in various places, and you can find access to those articles that you would otherwise not have access to through your library. Identifying this access is easy. To the right of the search result, you will see [PDF] available from XYZ or [HTML] available from. For an example, here is a search for my own research . 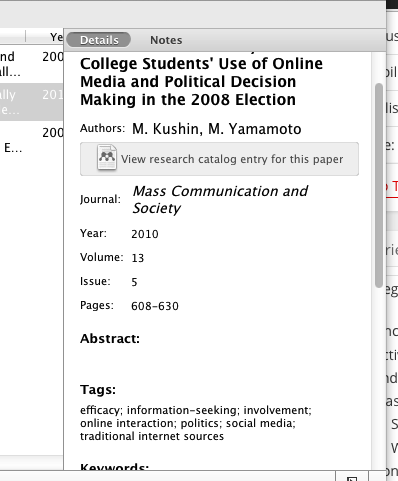 Notice how the “Getting Political on Social Network Sites” is available as HTML from the online journal First Monday. Example of Google Scholar Search Results. See explanation of features below. Click this image to enlarge it. See an article that you want to get access to, but your library doesn’t have it and you don’t see a PDF version offered in the search results? Click “## versions” directly under the search result description. Sometimes, the primary result that Google shows does not provide access to the article, but alternative versions do. By clicking “## versions”, you may find that another version of the article is available online. When conducting research, we’re often looking for research on a particular theory, construct, etc. So, if we find an article that fits our search goals, wouldn’t it be great to see what other articles are similar? The “Related Articles” link under the search entry does just that. For example, if I find an article on agenda setting in social media in a search result, and want to see more like it, rather than try a new search query, I’ll click “related articles” under the article I like for a whole host of articles related to agenda setting on social media. The cited by feature offers a similar benefit to the “related articles” feature. It is very helpful because you can see who has cited this work. Why is that great? Because if the article you have found is of interest, likely those works that cited it are related and may be helpful! More so, they may have built on that study and thus their theory and findings may provide more recent insights and advancements to the topic you’re studying. If you want to see more articles by a specific author, click an author’s name (such as my name in the example above). This will take you to the author’s profile on GScholar (if they have one) where you can see all the articles they’ve published. This is something I’ll discuss more in a future post. Want the APA or MLA citation format for the article in your search result? Click cite. A window pops up and you can choose the citation you need. Quick. Easy. Super helpful. You can also import into particular format styles. This is a new feature and one I just discovered. It works sort of like how Mendely lets you create a library of articles. You need a Google Scholar account to use this feature – which is of course free and connected to your Google account. What you get, is an online custom list of articles. When you enable Library, you are asked if you want to import all articles you’ve cited. That is, Google indexes all the articles you have cited in the online publications Google has associated with you. To access your library click “My library” at scholar.google.com. To add articles to your library, in a search result, you can click “save” to save that article directly from search results into your library. It seems the deleting articles requires you to click on them individually and then click delete. I found no mass editing. You can set up labels to organize articles into categories. For example, I may have a label “politics” another “social networks” and another “blogs.” By clicking an article in your library, then clicking the ‘labels’ drop down you can create and select labels. This is a brand new feature and it has a lot of potential. Given that I’m a big Mendeley user, the library feature may be redundant. But I’m going to play with it and see if it has added benefit. I do like the idea that it provides direct access to articles available online. Do you use Google Scholar for search? What are your favorite features? What do you think about the new library feature? Now that the semester is over, there are two major things I like to spend my break doing: research projects and optimizing my classes with mods and improvements (or creating new classes, if needed). So, let’s talk about research! When it comes to research, there is one piece of software I could not live without: the FREE app Dropbox. Nothing has more fundamentally changed how I do research than Dropbox. That’s because much of my research is collaborative with great scholars such as Dr. Francis Dalisay and Dr. Masahiro Yamamoto. (Yes, not even Mendeley – Not so long ago I talked about how Mendeley reference manager changed my life when it comes to productivity in research). The Rundown: Dropbox is free and works with Mac or PC, or mobile devices. You get 2 gig for free (at least, that’s how much you got when I signed up), and can get more free space by completing certain actions like getting a friend to sign up (I now have 4.5 free gigs). There are paid versions. I was under the impression that just about everyone was using a tool like dropbox when collaborating with others on research, until I heard otherwise from numerous colleagues. Many are still relying on the old fashion approach of: Edit and Email. So I thought I’d take a minute to highlight the crucial benefits of synching software for collaboration on any document. Before I started using dropbox, my research collaboration life went something like this: One person would work on a manuscript document. When he/she was done, that person emailed the document to me with some comments on changes made. I’d then take my turn when I could and reply back with an attachment of the document updates. Meanwhile, the other person was waiting on me and if it was a busy time of the semester, that may have been several days or a week. If he had downtown and could work on the document, or had a sudden inspiration, he was unable to for fear that I was making edits to the file he had previously sent me and to try and merge the changes between conflicting documents, his new edits and my edits to the original he’d sent me, would be a big pain. This made for a slow, slow, painful process. And that’s only with two authors. Things get exponentially more complicated with 3 or more authors. Dropbox or other software like SugarSync enables you to share folders with others (through invite) that automatically sync whenever any file in the folder is changed, added, or removed. The folders are stored on your computer like a regular folder. You treat them exactly like any other folder, including the ability to have subfolders. For example, if I’m working on a manuscript titled Manuscript.doc, every time I save the file, everyone else who shares the folder with me is automatically updated to the latest version of the file (if their computer is off, it will sync when it is turned back on). When I’m done working on the file and close it, everyone immediately has the latest version of the file. A coauthor can immediately open the file and begin working on it. When she’s done, I can pick right back up, or a third coauthor can begin working (Note: You cannot work on a file simultaneously or there will be a conflicted copy saved to your folder). This eliminates the “hurry up and wait” nature of Edit and Email and the major headache of different coauthors having different versions of the manuscript, such as trying to merge one person’s edits into the latest version. To avoid the possibility of multiple people trying to work on the file at the same time (which causes a conflicting file to be created in your folder that you then have to manually go through and be sure any conflicts are resolved), we always send a quick email letting the other co-authors know we are about to start working on a document or that we plan to work on a document at from, say, 1-3pm this afternoon. If I could – I’d give Dropbox a high-five for helping me greatly increase my productivity as a scholar when it comes to collaborative work! Add / remove files to your group folder – Because the folder syncs, you can quickly add other documents to the folder such as data, data analysis results, etc. and everyone will have access. Previous Versions: Previous versions of files are automatically saved to Dropbox. You can access previous versions of a file by logging in at dropbox.com. Multiple devices: The software also synchs your files between your own computers, smart phone, or tablets. So you always have access to these files whether on your work computer or home computer or mobile. I use this all the time not only for research but for teaching materials. This way, I don’t have to lug my work computer home with me if I want to access or work on any files from my home computer. Web Access: Don’t have access to your own computer? You can access all your files on dropbox.com. However, any changes you make to files will need to be manually re-uploaded to dropbox.com when you are done. That’s all for now! Best of luck to everyone who recently submitted to ICA. Hopefully my papers are accepted and I get to see everyone in Seattle! Do you use Dropbox or a similar synching service for research? What do you like about it? What tips and advice do you have to share with readers? Which synching service is best? I went on a 10 minute pro-Mendeley rant that I’m quite sure she wasn’t prepared for! Though I’m sure it was much more than she ever wanted to know about reference managers, it made me realize just how much Mendeley has changed how I do research. Are you a disorganized mess when it comes to doing research? I know I was. And it was frustrating! Mendeley has helped me become much more organized and expedited the research process for me. Mendeley software is a “free reference manager and PDF organizer,” meaning it organizes your research articles which are directly connected to the research article PDF files on your computer. The program is a standalone application for Windows or Mac. Below, I’ll talk about the benefits. When I was first learning to do research in grad school, our professors would assign us articles and we’d go photocopy the class set (or if we were lucky, the professor would print them out). Journal articles were available online, but professors all seemed to be old school and prefer print copies. So this is how I learned. I soon found myself trying to organize folders upon folders of articles, many of which I thought I’d never need again but was afraid to get rid of. I soon ran out of room. I’d keep piles at home where I’d do most of my work, and others in my office. I’d lug stacks of them back and forth across the hills of Pullman (yes, often in the snow… and yes, both ways since I had to go down a hill then up 1 to get from my house to school), often to find out the one I wanted wasn’t with me causing delays and frustration. My apartment floor was littered with folders and articles. I’d go digging through them, never seeming to find the one I wanted. Can you relate? Then I began downloading them to my computer. But organization was difficult. I’d try to title the articles so I’d remember them, and place them into folders as best I could. These folders weren’t printable so it seemed impossible to find the article I wanted. I’d open tons of PDFs before getting the right one, wasting valuable time. I couldn’t mark up the articles online, so then I’d end up printing them. Yes, I’d tried Endnote but the version I had didn’t connect to the articles (or I didn’t understand how to use it), so it was like a Dewey Decimal system and I’d have to go find the article in my “stacks” – a disorganized mess on my computer or a hard copy. I played with Zotero, which was then a Firefox extension and wasn’t happy. I’d all but given up when I discovered Mendeley. Here is why I love Mendeley. Auto-exported bibliographies with meta-data: When you add an article to Mendeley, it pulls the article meta data such as article title, authors, journal, etc. This data is now all searchable, sortable, and the citation can be exported in the reference format you desire, such as APA. If it can’t find the data, click ‘search’ and it will try and get the correct data via a Google Scholar search. Saves me tons of time! Tags and Keywords: I can also add my own meta data. While there are many fields like abstract and notes, my favorite are tags and keywords. When I read an article, I will pull out constructs from the article and enter them as tags. Say, ‘political involvement’ or ‘efficacy’. Now, when I’m working on research and I realize I need something on political efficacy, I do a quick search of Mendeley and find all the articles I have that cover political efficacy. Talk about a time saver! While there are folders, this offers an easier way to find articles as often an article covers multiple subjects. Drag and Drop Articles / Auto Organization of Articles: Mendeley not only organizes your articles in the application, it also organizes the folders on your hard drive. To see the options, click “preferences” from the menu bar, then the “file organizer” tab (in Mac). It works two ways. 1) You can select folders for Mendeley to scan. Anytime an article is dropped into that folder, it will import it into Mendeley and also name the article as you’ve decided, such as by year – author – journal title. 2) You can take an article from a folder or your desktop and drag it into the Mendeley app. 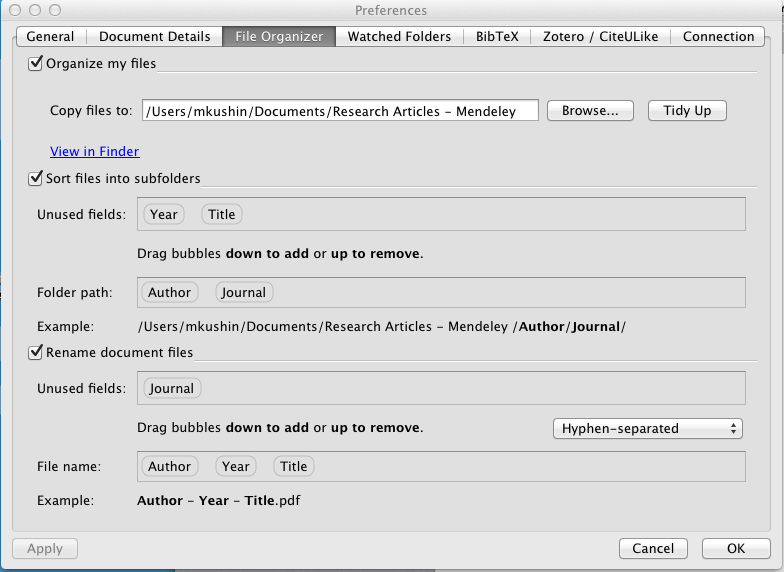 Mendeley automatically imports it, including references, and saves a copy to your designated folder on your hard drive. PDFs are connected to your references: When you pull a reference up on Mendeley, you’re not just getting the reference and your tags, notes, etc. You are getting the PDF that’s on your hard drive. So it is super easy to access the article. 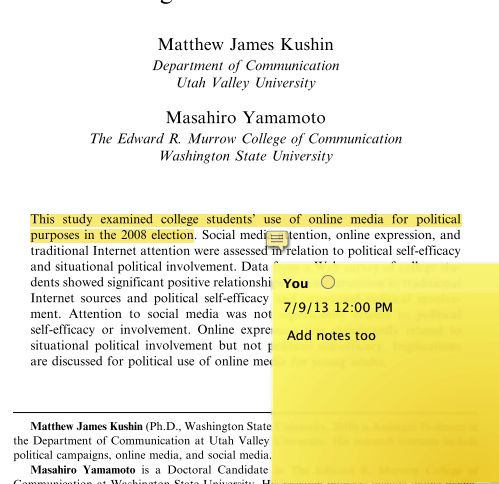 Markup documents: Once you open the PDF, you can highlight it, add comments, and more. Mendeley saves these markups. No more need to print out the article for markup. synching across computers: No more lugging of articles back and forth or making sure you have the PDF on the right computer. Install Mendeley on multiple computers and your library can be synched between computers (there are data limitations of 2 Gig, but I am not close to reaching them).iPhone / iPad integration – I haven’t used this, but if you need access to your library on the go this is for you! Private Groups: You can create private groups or join public groups on Mendeley. I have used private groups to have discussions and share articles with colleagues. The online storage feature allows you to upload articles to your group where your colleagues can access them making it very easy to share research articles. See a full list of Mendeley features. I haven’t even gotten into the web features of Mendeley. While I don’t use these features as much, they are worth noting. So as not to overwhelm you with my excitement for Mendely, I’ll hold off mention of these for another post. My gosh! Mendeley collaboration, citation and bibliography tool, where have you been all my life?! (note: See the follow up article on the new mendeley features)?